Economists have long argued that transportation inefficiencies amplify the differences between superpowers and developing nations. While much of the world is focused on eliminating the digital divide,* geographic barriers remain as towering economic differentiators. That fact is not lost on transportation innovators like Elon Musk, revealing Tesla’s new electric Semi late last night. As news media and enthusiasts talk about how bold and exciting the reveal is, don’t miss the more groundbreaking economic earthquake underlying the announcement. Tesla is on a trajectory to alter the balance of geographic dominance, through overland innovations. One of the great advantages the US has always had over other markets, is a superior network of rivers and waterways. From the early days of interstate trade in the fledgling democracy, this reality made the country wealthier through more rapid exchange of goods and ideas, culminating ultimately in export efficiencies and dominance globally. In other words, using existing modes of transport, under current efficiency models, the costs to move shipments around and within countries like China are significantly more profuse than in America, based solely on geography. But any degree of improvement in alternative modes of transport has the potential to widen the chasm between the US and others—if America embraces technologies like the electric semi. Or, to level the playing field more and more, as other nations in Asia, Europe, and Africa follow suit. The way around a lack of natural geographic transportation routes has always been to build infrastructural efficiencies—roads, tracks, bridges, train stations, airports—and all the fueling, ticketing, tracking, and maintenance ecosystems that contribute to transport continuity. But infrastructure which overcomes geographic inefficiencies is most often achieved at a high cost throughout each phase of development, from design to construction to maintenance, over the long-term. In modern times, waterways, railways, roads, and airways—all forms of conveyance—are maximized by the efficiency of the transport vehicles operated in any given domain. Arguably, there have been limited changes to most of these freight modes in recent times. This is not to ignore or downplay huge safety improvements, speed improvements, and other linear advancements. But it is to say, much of this has been predictable along a curve. Tesla’s Semi reveal demonstrates that innovations in some industries are set to leapfrog incumbent players and tech as they push for non-linear progress, sidestepping more entrenched industries with their own problems of inertia and old ways of thinking. The numbers disclosed at the event should be impressive to anyone, even if you aren’t well versed in trucking and domestic freighting. Tesla will not be the only all-electric truck targeting a 2019-2020 delivery date. Volvo and others have announced that they too have seen the direction all this is heading, and are not about to give up their own turf in the transport wars without a fight. But Tesla has created a phenomenon. And there’s enough secrecy concerning details along the way that when they do large public reveals—like last night’s—it’s the first time competitors gain even a high-level view into what they’re up against. It seems that Musk has taken a page out of Steve Jobs’ playbook, and he’s managed to create a similar kind of enthusiasm during live presentations, unlike Jobs’ own stage successors, who haven’t quite learned that it’s not just about tone of voice, pace of delivery, and a few well-timed pauses for effect. Musk’s rough-around-the-edges presentation style is proof positive that timing and oratory weren’t ever the main thing in the tech world or any other business domain when it comes to engaging fans and early adopters. What clearly resonates is the wonder of discovery and the enthusiasm of the inventor. Will the US be the primary market for Tesla Semi? Or will other nations seek to shift their own geographic imbalances through a universally more efficient trucking network? Time will tell who has bought in (as of today, Walmart has already pre-ordered 15). But one thing is certain. This is more than a new gadget or toy. 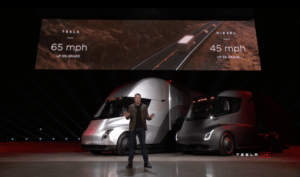 If Tesla Semi delivers even the basic statistics Musk promises, it will alter the trucking industry for good, and may just change the trade balance of a few states (or even nations) in the process. *The digital divide describes the gap between those with access to computing power and the web, and those without. 2. Hobbs, J. J., & Missouri, U. O. (2016). Fundamentals of World Regional Geography. Brooks Cole, 520.